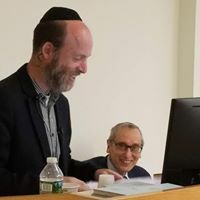 Dr. Maoz Kahana of Tel Aviv University expounded upon the reactions of the Hatam Sofer (Rabbi Moshe Sofer, 1762- 1839) to the modern challenges against traditional Jewish faith. In 1670, Benedict Spinoza, drawing upon the philosophical and scientific thought of his day, published his Tractatus Theologico-Politicus which argued that the Bible should be studied as a human document in its plain sense only. The influence of Spinoza’s teachings is evident, for example, in Moses Mendelsohn’s Beur and in Shlomo Maimon’s autobiography. Hatam Sofer responded to the proponents of Reform – influenced by those trends – with the catch phrase, “New is forbidden from the Torah.” Paradoxically, however, to those faithful to tradition he stressed the importance of innovation in the battle against the new. In combating Spinoza’s new hermeneutic, the Hatam Sofer emphasized that the divine nature of the biblical text allows for multiple, even infinite, layers of meaning. The Hatam Sofer wrote that the incorrect scientific perception of the text necessarily engenders the loss of Jewish creativity as hiddushim – new Torah insights- are emptied of meaning. Hatam Sofer himself actively engaged in writing hiddushim and fashioned a name for himself on this basis. Hatam is an acronym for hiddushei torat moshe. In creating hiddushism, the Hatam Sofer used the process of concealment and innovation. In studying Talmud, he would question the basic understanding of the text (concealment) in order to reach a completely new understanding (innovation). Also, in answering halakhic queries, Hatam Sofer would rely first on intuition (concealment) and only then legal analysis (innovation). Even the eschatological vision of the Hatam Sofer accentuated the idea of hiddush or renewal. Remarkably, he even wrote that in the time of the Messiah, the Talmud would be annulled and new greater wisdom would be revealed and studied. The Romantic school, which focused on innovation and a return to popular culture, offers another interesting parallel to Hatam Sofer’s emphasis on hiddush and adherence to tradition. The Brothers Grimm’s collection of fairy tales and the writings of philosopher-poet Friedrich Holderlin are examples of new works of the Romantic School. Romanticism stressed the importance of originality and spontaneity, even, creation ex nihilo, within art. Dr. Kahana underlined the similarities between these ideas and those stressed independently, but simultaneously, by Hatam Sofer and R’ Nahman of Bratzlav.